THE WORLD is facing a nutrient crisis, says a new report. Nutrients, like nitrogen and phosphorus, are essential for raising crops to feed the ever increasing population and in production of energy. But the report, ‘Our Nutrient World’, suggests these human activities have altered the natural flow of these nutrients. While some progress has been made in reducing emissions from combustion sources and waste water treatment, very little has been done to reduce emissions from agriculture. This is threatening sensitive ecosystems and leading to land degradation, climate change and adverse impacts on human health, says the report commissioned under United Nations Environment Programme. The report is an analysis by 50 scientists from 14 nations and was launched globally between February 18 and 22. The findings suggest that 20 per cent improvement in nutrient use by 2020 can reduce annual global nitrogen fertiliser requirement by 20 million tonnes, saving over $160 billion per year. The report emphasises an urgent need to understand and quantify nutrient cycles for sustainable agriculture and energy practices for the future. 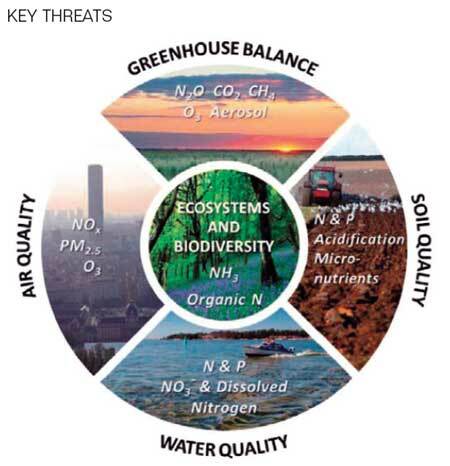 It laments that current climate change debates neglect the major challenge of world’s nitrogen and phosphorus cycles which, too, are important contributors to the change. In India, while fertiliser underuse is damaging soils in vast areas of rain-fed agriculture, their overuse in irrigated areas, mainly for cereal production, is increasing nutrient losses. One of the authors, N Raghuram, who is the director of the South Asian Nitrogen Centre, says India has a huge nutrient recycling industry but this does not yet serve nutrient management for the agricultural sector. We also lose a lot of nutrients from intensive animal husbandry, aquaculture, poultry, etc. “An effective mechanism is required to recycle human wastes for agriculture through innovative steps like urine-separating toilets that would capture nutrients and return them to the soil,” says Raghuram. This is important as we do not have adequate deposits of the minerals, he says. India’s phosphorous deposit is only 3,06,000x106 kg—nearly 30 per cent of it is low-grade and useless for the fertili ser industry. Phosphorous fertiliser consumption, however, has increased from 53x106 kg in 1960-61 to 7,300x106 kg in 2009-10. It is likely to increase further and reach 14,000x106 kg by 2030-31. Y P Abrol, president of the Society for Conservation of Nature, blames lack of coordination between the Ministry of Agriculture, the Ministry of Chemicals and Fertilisers and the Ministry of Earth Sciences for lack of awareness. “For Indian farmers fertilisers mean urea and not nutrients. This is one of the big reasons for imbalances,” says Abrol. He says a change in our nitrogen cycle can only happen if farmers understand the importance of nutrients. O P Rupela, a former principal scientist at International Crops Research Institute for the Semi-Arid-Tropics, in Patancheru, Andhra Pradesh, says, “The report adequately covers harmful effects of fertilisers on the environment and people, and I’ll call them pollutants.” But he adds that a plant needs about 30 nutrients in balanced form for good growth and not just the elements mentioned in the report. The report considers all sources of pollution and highlights that growth of fossil fuel-based thermal power plants and private transport, especially diesel vehicles, is leading to nitrogen loss in the form of nitrogen oxide. Rupela says the report fails to clearly say that agriculture is the biggest source of the pollution. The report recognises that uncontrolled nutrient use is a global problem, especially given the global trade in agricultural products. It calls for an intergovernmental framework to address these issues, and proposes a road map of how such an agreement would look. Although the report has UN label the main thrust is the genre Ã”Ã‡Ã¿local action for global concernsÃ”Ã‡Ã– . That means the Indian scientific community in general and agricultural scientists in particular have an uphill task ahead of them. The agricultural scientists have been working against the interest of the Indian farmers and healthy soil in this respect. A cursory look at the Krishi Karman awards list since its inception will show how and why it is so. The rest is taken care by the Rashtryia Kosh se Vyarth-Vyay YojanaÃ”Ã‡Ã–s (RKVY) Ã”Ã‡Â£made in Krishi BhawanÃ”Ã‡Ã˜ template. Look at the miniscule funds allocation as well as number of projects in particular to assess the deep rooted nature of the malaise. Shedding of crocodile tears by scientists, as reported in the articles are indeed very unfortunate because their commitment to the cause is certainly exposed. It is high time agricultural scientists start doing a self Ã”Ã‡Ã´examination as their belligerent and rebellious sounding Congress Roadmap with equal support of ICAR and FAO is certainly accelerating towards the nonredeemable precipice of environmental disaster. It is also a golden opportunity for the task force on fertiliser subsidy to fix the nutrient based pricing quick-fix that has hastened creation and sustenance of the eutrophic ecosystem in the Indian agriculture system.